The season of entertaining is upon us. I’ve partnered up with Sauza® Tequila to bring you a new cupcake recipe and some inspiring ideas for a fabulous Holiday Girls’ Night! The holiday season is well underway. 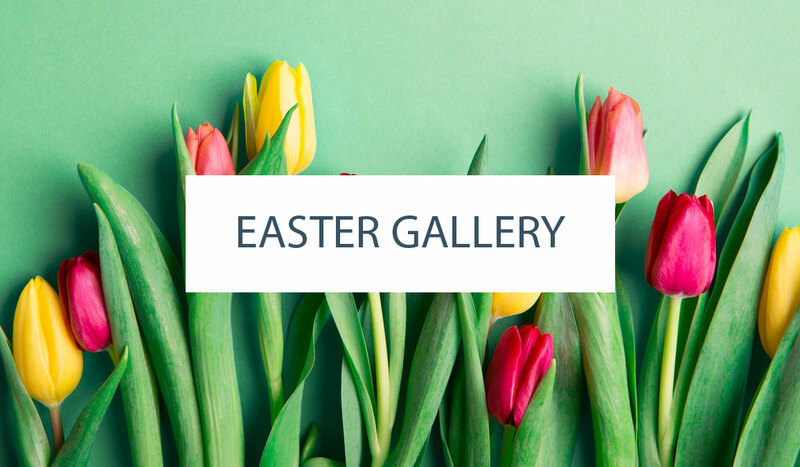 This is the craziest, busiest and most wonderful time of the year! Whether you’re an entertaining newbie or a seasoned pro, the role of hostess can be a stressful assignment. But entertaining doesn’t have to be hard. You just need a plan to make it all happen! 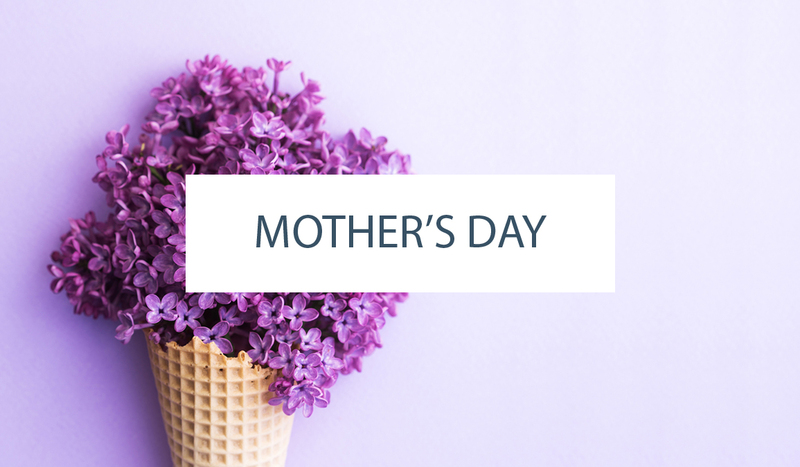 So grab your girlfriends and celebrate the season with a fabulous girls’ night in. 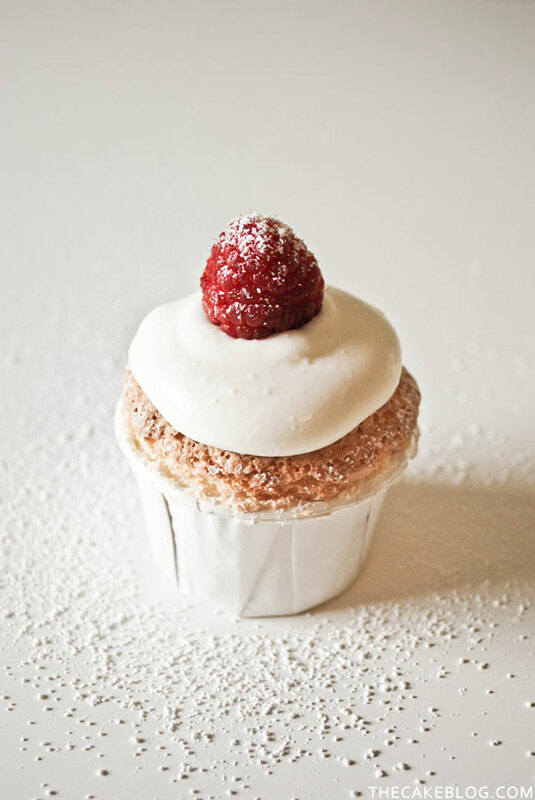 We’re keeping it elegant and effortless with light angel food cupcakes and a glass of Sparkling Margarita. It’s a refreshing change to the same old, same old holiday party. Let’s start with the cupcakes and move on from there! Priorities, right? Planning the cake always comes first! Angel food cake is one of my all time favorites. It’s light and sweet and totally unexpected around the holidays. So I thought cupcake sized portions would be a great addition to a girls’ night in. It’s a refreshing change to the heavy desserts we often enjoy during the month of December. And definitely pairs nicely with a bubbly glass of wild berry Sparkling Margarita. The greatest thing about these cupcakes? They look impressive but they could not be easier to make. We’re taking a classic angel food cake recipe and adding a small touch of lemon zest to brighten the flavors. 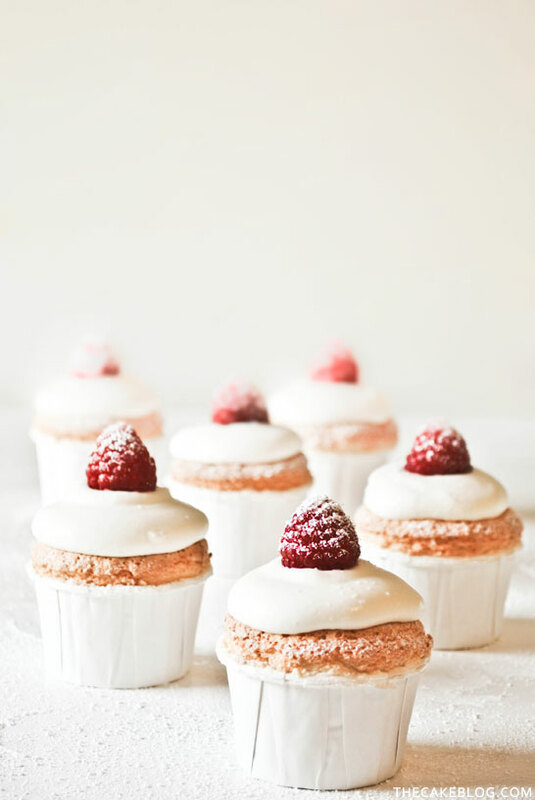 Then topping with a sweetened whipped cream and fresh raspberries, creating a little airy delight. The only thing hard about these cupcakes… is eating just one. 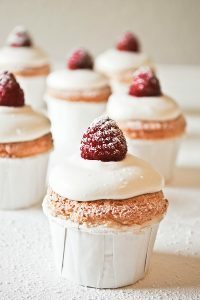 Snow Angel Cupcakes – light angel food cupcakes with lemon zest topped with whipped cream and fresh raspberries. In a food processor, pulse sugar until it is superfine. Roughly two minutes on low. Combine ½ cup sugar with cake flour and sift together four times. Set aside. In the bowl of an electric mixer filled with the whisk attachment, beat egg whites, salt and cream of tarter until medium firm peaks. Sprinkle remaining 1 ½ cups sugar over egg whites with mixer running. Mix until thick and shiny. Add lemon zest. Mix several additional minutes until very thick. Remove bowl from stand mixer. Scrape down whisk attachment, removing all egg whites and zest. Sprinkle ¼ of flour mixture into bowl and gently fold into egg whites using a clean rubber spatula. Repeat until all flour has been added. Spoon batter into a muffin tin lined with cupcake wrappers. Fill each wrapper almost to the very top. Smooth top. Bake 17 – 20 minutes or until toothpick comes out clean. Cool for 5 minutes and then remove from muffin tin to cool completely. In the bowl of an electric mixer fitted with the whisk attachment, whisk chilled heavy cream and 4 tablespoons sugar until you have soft peaks. 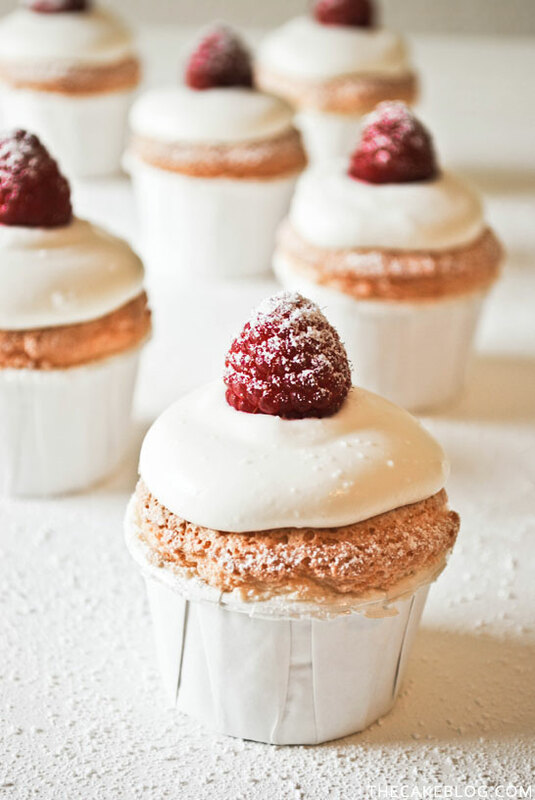 When ready to serve, spoon a dollop of whipped cream on top of each cupcake. 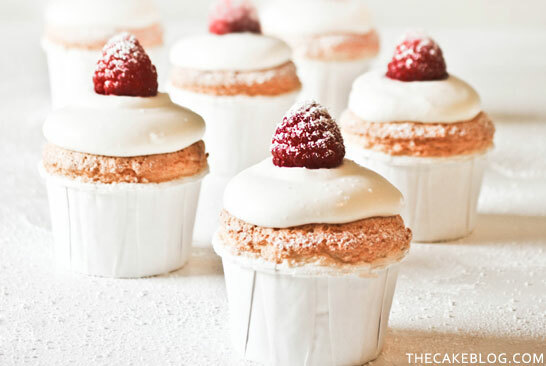 Top with a fresh raspberry and a sprinkle of confectioners sugar, if desired. To make whipped cream topping in advance, use mousse powder, gelatin, cream cheese or another stabilizer to prevent the cream from deflating. Now that we have the cupcakes covered, let’s talk about the rest of our Holiday Girls’ Night In! I love the idea of offering a selection of mini desserts and cookies for guests to nibble while sipping a glass of Sparkling Margarita. Small bites like cookies and cake pops let the girls sample a little bit of everything without the heaviness of a big dessert. Here’s a few ideas to get you started. 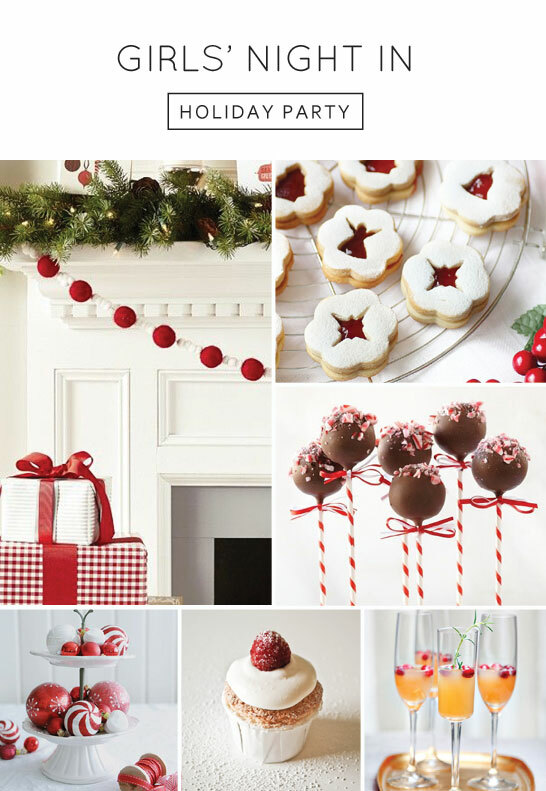 When decorating, go for a simple color palette of red and white. This updated twist on the traditional holiday colors has such a fresh look. Linzer cookies are a classic treat that work nicely with our color scheme. Two almond flavored cookies are sandwiched together with a layer of jam. Get the recipe to make them HERE. Cake pops get festive with a hint of peppermint and a striped stick. Make your own or cheat and order some HERE. Serve up Sauza® Sparkling Margarita with festive garnishes like cranberries, raspberries or rosemary. Of course, we’ll include our Snow Angel Cupcakes! Pull out your extra cake stands and top with ornaments for a quick and easy centerpiece. Done! If you’re ready to get the party started, you can find more Girls’ Night inspiration on my Pinterest board HERE. Cupcake recipe and photography by Carrie Sellman for The Cake Blog. Thank you for supporting the sponsors who help keep this blog going! Do you know if these bake well as mini cupcakes? 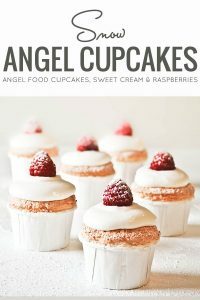 Honestly, Angel Food is so light and airy to start out with that the standard size cupcake portion left me wanting more. Maybe that’s because I liked them so much! So I haven’t tried them as a mini. But if you do, definitely come back and let us know how they turned out! Do you have a suggestion for the use of the 12 yolks? Just use egg whites from egg beaters. That’s what I did and they still turned out beautiful and tasty! These ARE miniature cupcakes.. Otherwise, where in the world would you find raspberries the size of golf balls…? They are regular sized cupcakes. It was just a nice package of raspberries from the grocery store. Oh lovely! I’m always looking for healthier, lower calorie desserts. I love Angel Food & love making it. I’m not sure why I didn’t think to try them as cupcakes. I received my first KitchenAid mixer for Christmas from my mother and searched for my first recipe and have to admit your recipe caught my eye. I was excited to try this out and some time later success! Finally had an opportunity to make these for my husband’s birthday. They turned out fantastic; he loved them (& so did I). Thanks much for sharing this recipe! Hi! I’m excited to try these this weekend! Once topped with whipped cream how long can they stay out of the fridge? You could certainly bake the cupcakes a day ahead. You’ll want to store them in an airtight container to keep them moist. But I wouldn’t top them with the whipped cream until you’re ready to serve. Where did you get the cupcake liners that are shown in the photo? I believe they came from Michael’s but it’s been three years, so I’m not 100% sure. Oh boy. I baked these for 20 minutes and they totally burned. I should have checked them sooner I guess. So frustrated with myself because they are supposed to be for a friends birthday. Would it possible to freeze the batter I have leftover? I will bake angel cupcake. You’re a very creative person.